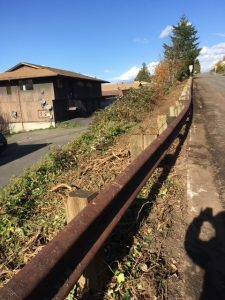 Mark Dorsey, Port Orchard’s public works director, says the spot was ditched for utilities to serve the housing being built south of Horstman. The struggle continues, apparently. As of mid-day Tuesday, the patch was unchanged. The in basket: For what I’m sure is a lot interest in when Bethel Road in South Kitsap will be made more drivable, John Susan is the only one who has asked me about it in 2014. 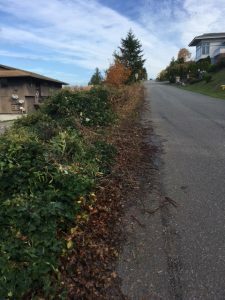 He was moved to follow up his April inquiry with another this fall when he noticed that Lund Avenue to the east of Bethel had just gotten some full-depth patching, often called dig-outs. “They worked on Lund, which was much better off than Bethel,” he said, adding that just repairing the sunken manholes on Bethel would have been a better use of the money. The out basket: Different jurisdictions, John. Port Orchard annexed the Bethel corridor a few years ago and has been searching for money to accomplish short- and long-term upgrades of Bethel, as well as the city’s double-round-about plan for Tremont Street. The Lund Avenue patching was done by the county, The city limits end just west of Hoover Avenue. News coverage of Port Orchard City Council budget talks that included money for Bethel Avenue said 2015 work will be at the Lund-Bethel intersection. I wondered how broad that would be defined and whether it would extend up to the Walmart traffic signal, where it seems the ride is the roughest. Mark Dorsey, Port Orchard public works director, says, “The city will focus the 2015 asphalt repair work at Bethel-Lund, since this area will not be affected by future design modifications associated with the future Bethel corridor redesign. “A complete grind and overlay is proposed. I do not have specific limits of yet, but it will not extend to Walmart. That will more than likely be 2016…and not a complete grind and overlay, but specific grind-outs with repair. The in basket: Bryan McKinnon says the steep intersection of Sidney Avenue and Kitsap Street in Port Orchard is hazardous. “Having experienced vehicular woes here myself, I can say that it is very difficult (day or night) to monitor traffic moving north-south on Sidney, especially if driving in a car (vs. an SUV/Truck). Night time, headlights from uphill, southbound vehicles seem to get lost at one point just past the museum. I asked him what he’d suggest and he replied, “I’ve started focusing on vehicles turning right off of Prospect Street to head south up Sidney. I think those can be the ones that slip past plain view. Perhaps the simple fix is put a stop sign for southbound traffic at Kitsap/Sidney. However, if right turns off Prospect are suspect, then no right turns off Prospect onto Sydney. The out basket: I’m very familiar with this intersection and am one of the short cutters who use it to bypass some of the backup on Bay Street in the afternoon. I don’t speed on Kitsap though and have never felt “battled” when I’m there. I do agree the uphill traffic is obscured by the slope and can surprise someone waiting at the stop sign at Kitsap Street, but a stop sign on that steep upgrade would be very unpopular with southbound drivers. I’ve never had a close call there. The in basket: Don Rude of Port Orchard says, “Bay Street, westbound just west of Rockwell Street, is the start of the new walking path. This is the most dangerous spot in town. The out basket: It’s not done yet, says Mark Dorsey, public works director for Port Orchard. Fencing and guardrail to keep drivers from making the kind of mistake Don envisions are yet to come.